Why Should You Switch to the TURBO-TOC®? filtration products from Advance Filtration. Why Should You Switch to the TURBO-TOC®? 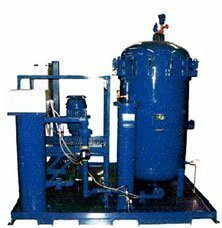 Kaydon Corporation filtration has a long history of effective performance in the turbine oil filtration system industry. The newest continuation of their revered production of steam and gas turbine filters is the Kaydon TURBO-TOC system. Its ability to filter out contaminants from dirt to water condensation increases both the functionality and, as a result, the life expectancy (from reduction of wear and tear and smoothness of operation). Replacing old filters with the new TURBO-TOC is taking the next step in the evolution of industrial filtration, whether it be a steam or gas turbine for any use. Since 1939, Bowser® 832P Turbine Oil Conditioners have been effective oil conditioners for mineral-based turbine oils in steam and gas turbines, as well as combined cycle turbines, used for power generation. Bowser® was purchased by Keene Corporation in 1968, and Kaydon Corporation gained control in 1984. The last 832P system both built and shipped in the United States was in 1982. All 832P systems manufactured after 1982 were shipped overseas, until the last 832P was shipped in 2005. The discontinuation of the 832P was due to several factors, with the primary reason being the development of the new TURBO-TOC system in 1987. As the TURBO-TOC gained more popularity by proving its superior design and performance, the 832P was eventually terminated. Turbine oils provide resistance to oxidation and sludge formation, along with being equipped with anti-rust/anti-wear additives, water de-emulsifying additives, and anti-foaming additives. With all of these properties, one would think that turbine oil would be protected in the environment of a steam or gas turbine lube system. But the contaminants of air, high operating temperatures, particulates, and water are always present in turbine oil systems, causing a continual process of oil degradation. Contamination of turbine oil occurs both from the outside and inside of the turbine lube oil system. External contamination enters through bearing seals and vents. Internal contaminants are generated where water is produced – gland seal leaks, oil cooler leaks, plus internal lube oil tank condensation – and from dirt, fly ash, wear metal particles, and oil degradation by-products. Unfortunately, turbine oil properties and additives alone are not enough to keep oil from degrading. An effective turbine oil conditioner – that keeps particle contamination (dirt, fly ash, wear metals) to an ISO Cleanliness Code of 16/14/11 and water content to 100 ppm – is needed. A switch to the TURBO-TOC® system will provide cleaner oil, plus provide easy to use and understandable operator interface controls. Water is a particularly harmful contaminant. Accumulated water promotes oil additive depletion, corrosion to metallic parts, reduction of turbine lube oil film thicknesses, and is the catalyst for microbial growth. Both free and stable oil/water emulsions must be removed to eliminate the effects water has in a gas or steam turbine lube oil system. Steam turbines are obvious candidates for water removal equipment, but gas turbines need effective water removal equipment also. Since gas turbines run about 30F-60F warmer than a steam turbine, small amounts of water can be driven off during normal operations, but small, stable, micro-emulsions do form which must be addressed. This is where a properly-sized, highly-efficient coalescing system provides a value and benefit. The goal, whether it be a steam or gas turbine, is to produce an oil that is “clear and bright” (also known as “clean-and-bright”: a condition in which the turbine oil contains no visible water drops or particulates, and is free of haze or cloudiness). The amount of dissolved water present in turbine oil is of little significance to oil life or mechanical wear, so it does not need to be addressed. If turbine oil is properly purified, most turbine oils will remain clear up to 100 ppm water concentration level at room temperature. The old Bowser® 832P system provides free water removal, but does not break stable water/oil emulsions. This is the area where the TURBO-TOC® system has shown its greatest performance. The TURBO-TOC® not only removes water quicker than any other water removal system, but it can dry the oil to the extremely dry level of 100 ppm. Turbine oil cleanliness levels are represented by ISO 4406:1999. ISO 4406:1999 uses a code to assign the number of particles larger than 4 11m, 6 11m, and 14 11m in a l/mL sample of oil. A cleanliness level of ISO 4406:1999 16/14/11 provides ultra clean turbine oil, thus eliminating any potential mechanical issues related to particulate contamination. The particulate filtration ratings and contaminant holding capacities of 832P filter elements have not advanced with new filtration technology to provide oil cleanliness levels of ISO 16/14/11. The TURBO-TOC® filtration elements use specially-formulated micro-fiberglass filter media to provide ultra-fine particulate retention, plus offer extended element life. The deep-pleated, high-surface area elements are supported upstream and downstream to provide element integrity. An ISO 16/14/11 cleanliness level is achievable with the new TURBO-TOC® elements. Unfortunately, oil purification systems are normally seen as an afterthought or a non-essential item when lube system reliability is considered. With the higher visibility of rotating equipment reliability taking the forefront in most plants, oil reliability and oil conditioning equipment reliability is of greater consideration. In determining the reliability of a turbine lube oil, properties/characteristics that should be considered are: (1) proper viscosity range, (2) oxidation stability, (3) ISO Cleanliness Particulate Code of ISO 16/14/11 or better, (4) anti-corrosion/anti-wear protection, (5) demulsibility (sheds water well), and (6) water contamination to 100 ppm or less. Proper oil purification equipment affects all of these properties, but has its greatest impact on the oil cleanliness, both particulate and water. The 832P system does not reliably remove oil contaminates to sufficiently keep the reliability performance factors for turbine oil at its optimum level. Proper oil characteristics are maintained only with a reliable oil conditioning system. Technological advances in oil/water separation with a Kaydon coalescer and advances in filter medias for high efficiency particulate removal coupled with extended element life are only found with the TURBO-TOC® system. 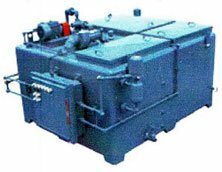 The 832P does not provide the type of reliability for oil purification that is required, and demanded, for to day’s turbine lube oil systems. Bowser 832P systems have been utilized in power plants for several years, and one of the most notable qualities of the 832P is ease of operation. Since it is a gravity-fed system, the only moving part on the system is the oil pump that pumps the oil through the polishing filter and back up to the turbine lube oil reservoir, plus the vapor extractor, located on top of the 832P. The 832P can literally run for several months without any operator involvement or maintenance, and no alarms or warning will ever be displayed that requires an operator to inspect the system for problems. This quality of the 832P has also been its number one detriment. The 832P has little or no informational displays to indicate the overall working condition of the system, or if the system is adequately working at all. Often, the 832P is seen as an easy to operate and maintain system, but when further inspection is made, signs of wear are visible, imbalance of gravity flow compared to pump flow is occurring, performance is suspect (especially water removal performance), and oil analysis show elevated particle counts. In addition, the often misunderstood “water leg” is determined that it has never worked properly and re-establishing the “water leg” is a difficult process to follow. After an 832P is overhauled with new filter bags, polishing filter elements, and other parts (bag screens, precipitation screens, seals, etc) are installed, the system shows its high maintenance characteristics. In comparison, the TURBO-TOC® provides much improved water removal and particulate performance, an easy to operate system, which gives graphical information to operators, plus provides much less maintenance issues, primarily with easy to install cartridge elements.